For Boston Children’s Museum’s recent Family Fest I had the pleasure of working with four different music presenters all in one day! They were a fabulously diverse line-up and exemplified the aspects of music-making that we try to emphasize in our regular performing arts programming. Over the next few weeks I’ll be posting about these presenters, the experiences they provided, other ways we provide music programs at the Museum and how you can provide similar experiences for your children at home. 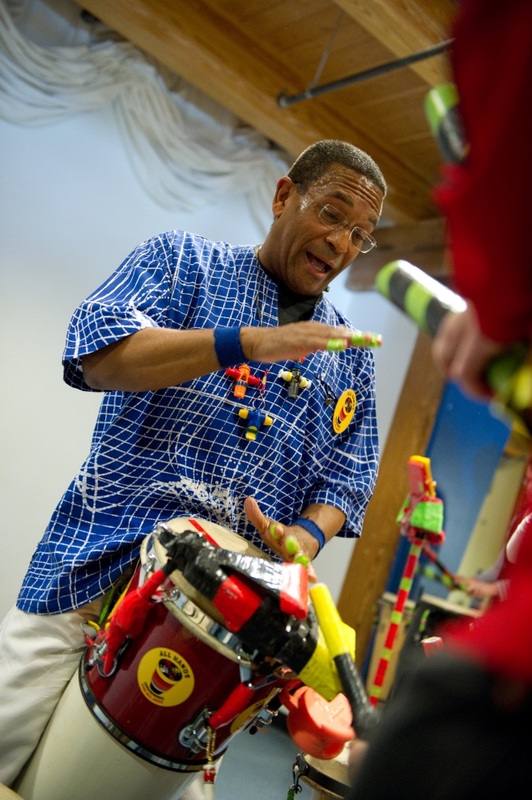 Tony Fonseca led a participatory drum circle with the rhythms of Cape Verdean music. He brought about 25 drums of various heights and colors plus some homemade arrangements of woodblocks and cowbells. Then Tony stood in the circle and kept a beat going for a solid hour. Families walked up, picked a drum they liked and joined in on the groove. When they were done, they left the instrument for the next person. What is the value in a program like Tony’s? There are no rules for kids to follow, no curriculum. We didn’t even learn what the instruments names were. What Tony provides instead is a safe space for experimentation. He gives kids a medium – percussion – and a context – Cape Verdean beats – and then it’s up to the individual to copy him, keep a steady beat or do something completely different. The experimenter could play the drum with sticks or bare hands, play the drum in the middle or on the sides, etc. The experimenter has to make choices, and while they might decide that some choices are better or worse, there’s no one to tell them which choices are “right” or “wrong”. Experimentation is an essential aspect of creativity and the courage to experiment leads not only to the development of other musical skills like composition and improvisation, but also life skills like problem solving and entrepreneurship. At BCM we encourage musical experiments every other week on Tuesday afternoons. Our instruments include materials you might have at home, such as colanders and 5 gallon buckets (though we do provide real drumsticks!). A couple of cool Visitor Experience Associates set these buckets and drumsticks out and start a beat, inviting children and their families to join in. There is no audience and no right or wrong answers. It is simple to conduct musical experiments at home, as well! If you don’t have any buckets, then a plastic flowerpot and a couple of spoons should do the trick. You can also try playing some music on your stereo or iPod for your kids to drum along with. And try some different materials as your “drums” and different materials as your “drumsticks”. Remember – the point is to give your child a chance to experiment, improvise and express herself.